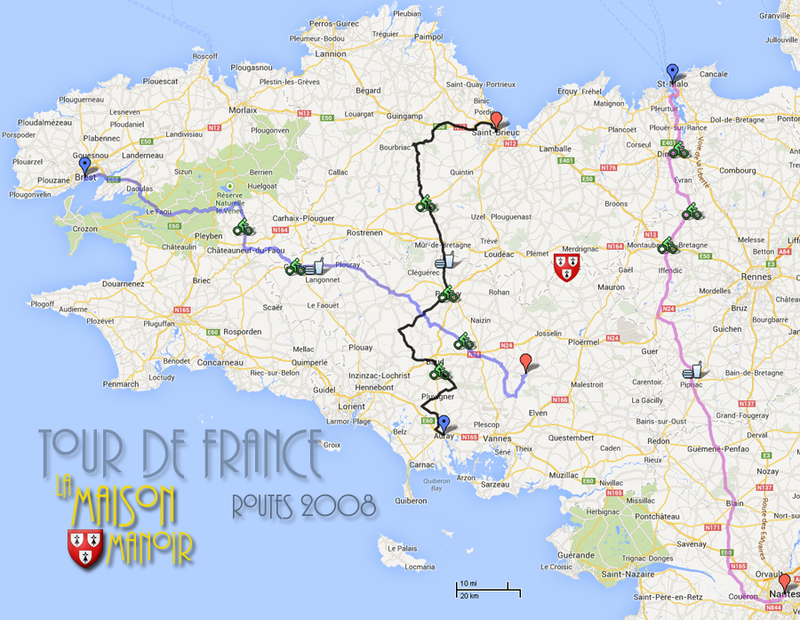 2008 Brittany Stages and Routes. 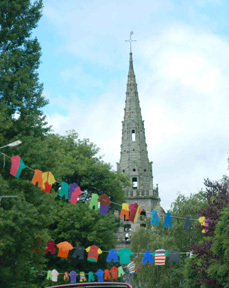 was actually the sixth time the Tour de France started in Brittany and the third time from Brest (1952 – first start in Brittany, 1974 and now 2008). The other Tour starts in Brittany were in Rennes in 1964, Plumelec (prologue) and Vannes (first stage) in 1985 and Saint-Brieuc (prologue) and Dinan (first stage) in 1995. Besides these starts there have been many other Tour de France stages which passed through Brittany, the first one being in Rennes in 1905. Brest is the most often visited start or finish city in Brittany: by 2008 it had been the 29th time. With four Breton Tour winners in the Tour history (Lucien Petit-Breton, whose real name was Lucien Mazan, in 1907 and 1908, Jean Robic who took the Yellow Jersey only at the end of the last stage in 1947, Louison Bobet in 1953, 1954 and 1955 and finally Bernard Hinault in 1978, 1979, 1981, 1982 and 1985) and many Breton supporters for all Tour de France stages, it seems to be normal for the Tour de France to be back with a ‘Grand Départ’ after 13 years without it in Brittany. The first stage of this 95th Tour de France starts in Brest in the Finistère and will finish in Plumelec in the Morbihan. As mentioned before, for the first time in 1967, this will not be a prologue but a regular first stage. Passing over the Monts d’Arrée, this first stage is 116 Miles. The Monts d’Arrée are part of the massif armoricain and have Roc’h Ruz as their highest point at 385 meters. This region is said to have the same kind of scenery as Ireland or Wales. The biggest atlantic heath land of France can be found here (over 10.000 hectares). After the start in Brest the riders will take the pont Albert-Louppe to go to Loperhet followed by Daoulas, L’Hôpital-Camfrout, Le Faou, Quimerch, Brasparts, Plonévez-du-Faou, Châteauneuf-du-Faou, Spézet and the col de Toull-al-Laëron in the Finistère and before going further to Gourin and Plouray, Guémené-sur-Scorff, Pluméliau, Remungol, Locminé, Bignan, Saint-Jean-Brévelay, Plaudren and finally Plumelec with the côte de Cadoudal. Connecting Auray in the Morbihan with Saint-Brieuc in the Côtes d’Armor, this stage will have a hilly track with the Mûr-de-Bretagne (a 1,6 km hill at 7,5%), also visited during the Tour de France 2004 and 2006, as a nice bonus. After the start in Auray going to Landaul, Pluvigner, Camors, Baud, Pont-Augan, Bubry, Melrand, Boderel, Guern, Le Sourn, Pontivy, Neulliac and Saint-Jean in Côtes-d’Armor. The stage continues to Saint-Brieuc, its finish. Starting in Saint-Malo and it will go southwards while crossing through the Ille-et-Vilaine department … This Stage covers 123 Miles. After the start at St.Malo going to Dinan, Becherel, Landujan, Montauban-Bretagne, Iffendic, Plelan-le-Grand, Maxent, Maure-de-Bretagne, Lieuron, Pipriac, crossing the river sees the route leave Ille-et-Vilaine, thus Brittany, and passing through Besle in the Loire Atlantique then onwards to Guemene-Penfao, through La Foret du Gavre, Blain, Fay-de-Bretagne, La Temple-u-Bretagne, Saint-Etienne-du-Montluc, Coueron and finishing at Nantes. While going through the Ille-et-Vilaine, passing close to Rennes and at the end of the department the first big city is Nantes, the finish city of the third stage of the Tour de France 2008 (this stage has the same start and finish cities as the 9th stage in the Tour de France 1980 ; won by Jan Raas from The Netherlands).